Yes, I know it’s like 30 degrees outside and there’s frost on the grass in the mornings and I’m wearing a wool coat, because I have finally acclimatized to the warmth of Alabama. And I don’t personally wish it was summer. I like the winter. I like the cold. I like rain and grey skys and falling leaves. 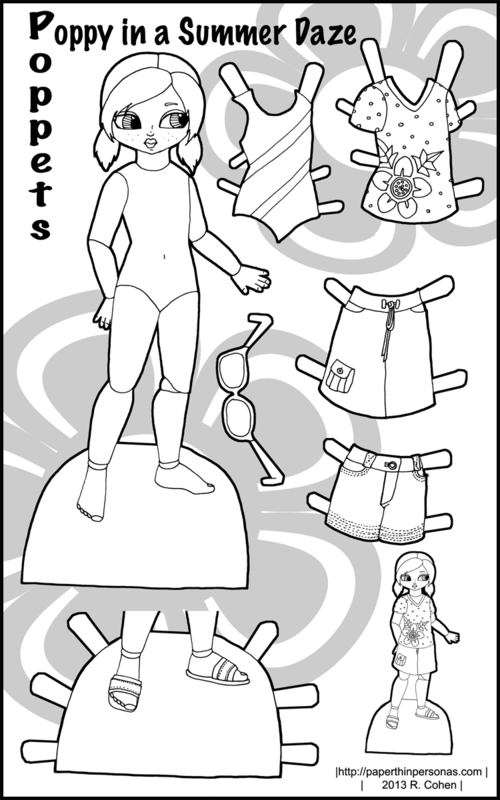 However, I also really like cute red-headed paper dolls with shorts and colorful t-shirts. It was recently pointed out to me that of my white paper dolls, I have a disproportionate number of redheads. This is true. I love red hair. I think it’s wonderful. I don’t have redhair, but I envy people with red hair. Therefore my paper dolls get red-hair more often than perhaps is genetically normal. Oh, I should mention that I have thought that the sunglasses would work really well and you could hook the two ends together behind the dolls head. When I tried this out, it totally didn’t work, so I recommend taping the ends together and slipping them over the dolls head. My paper engineering skills are in need of some work. I won’t lie about that. As a redhead myself, I have to thank you. I can remember my despair as a child when all my dolls were either blond or brunette. Except for that one time that my mother tried to dye the hair of one of my blond dolls using cherry Kool-aid. We won’t remember that one. I love redheads too, so I’m okay with you creating so many. I’m pleasantly surprised with how much I like these Poppets. I’m not a big fan of the dolls as paper dolls style, but these are great. Can’t wait to see what’s next. Thank you, Corissa. I’m excited about this series, much more than I thought I would be. OMG I was looking for a blank doll shape for by daisy troop and I stumbled across your site. I love it been printing all am for my 3yr old Lily. Love the sizes not all model sizes my daughter is as tall as a 5 yr old. so she has some weight on her but not over weight, but everything we see is so tiny not like her. Now we can play with life like dolls. I cant wait to tell everyone in our play group about this site. love the poppets. just thank you so much. You’re welcome. I hope they enjoy them.